Table of Sequence Variants. Table of Binding Sites. Table of Ligands. Explore Sequence Variants in Protein Binding Sites! You can also use our Conversion tool to obtain PDB input. Oh my. Please use a browser with webGL support. Convert from dbSNP's rs ID, COSMIC's Mutation ID, Uniprot ID or Uniprot's Gene Symbol to the PDB protein structure! No results to display, please enter a query. 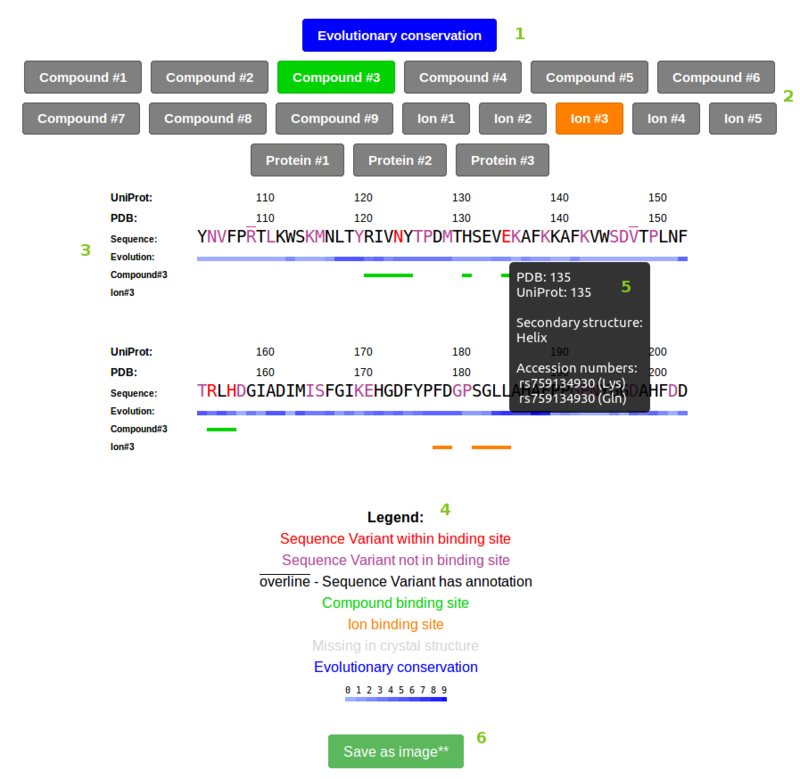 This is an interactive molecular viewer, which enables identification of polymorphisms within various biological contexts. Rotate structure by moving the mouse while holding the left mouse button. Zoom in and zoom out by either scrolling or moving the mouse while holding right mouse button. Move structure by moving the mouse while either holding the scroll(middle) mouse button or both right and left mouse buttons. Open information window by clicking on a molecule you wish to be the new center of rotation. Information window contains name, PDB and UniProt number of clicked aminoacid and Sequence Variant information. In Table of Sequence Variants there are a few overall information about the selected PDB; there is a link to genome sequence (1) and a link to species information (2). In the table itself are listed Sequence Variants with their accession number (3), with the attached link, information wheather or not this Sequence Variant is a part of a binding site (4) (color of the circle represents type of binding site and # number of binding site) and information on aminoacid change. If Clin-Var or pharmGKB information are available, they are presented as links to corresponing pages in Clin-Var o pharmGKB bases (5). For each Sequence Variant there are two buttons available, Select / Deselect button, Label button** and Zoom button** (6). A click on the first button selects/deselects a desired Sequence Variant. This Sequence Variant than appears/dissapeard on/from Draggable Table of Sequence Variants and on/from the viewed structure. Only one Sequence Variant per residue can be selected. The Label button shows/hides the label on selected Sequence Variant and the Zoom button zooms to and highlites selected Sequence Variant. In the header of the table there is a Select / Deselect All Sequence Variants button (7), which selects one Sequence Variant per residue at once or deselects all of them. For faster search there is a search bar (8) customized to search Sequence Variants by accession number and aminoacid change. Sequence Variants with unknown structure are listed below the Sequence Variant table in a No structural data available for the following Sequence Variants table. ** Label and Zoom buttons are synchronized with the label and zoom buttons in the Table of Binding sites and Draggable Table of Sequence Variants. In the Table of Binding Sites all binding sites are listed as tabs. ** First level of tabs are binding sites separated by type of binding site (1) and second level are bindng site of one type seprated by their binding site number (2). Only one binding site can be viewed at the time. For each binding site there is a table of Sequence Variants included in that binding site (3). The table is imported from Table of Sequence Variants and it's usage is the same. All other aminoacids that are not Sequence Variants are listed in a table Other aminoacids in this surface region (5), bellow the Sequence Variants table. Binding sites can be viewed as surface (default option) or as sticks (4). 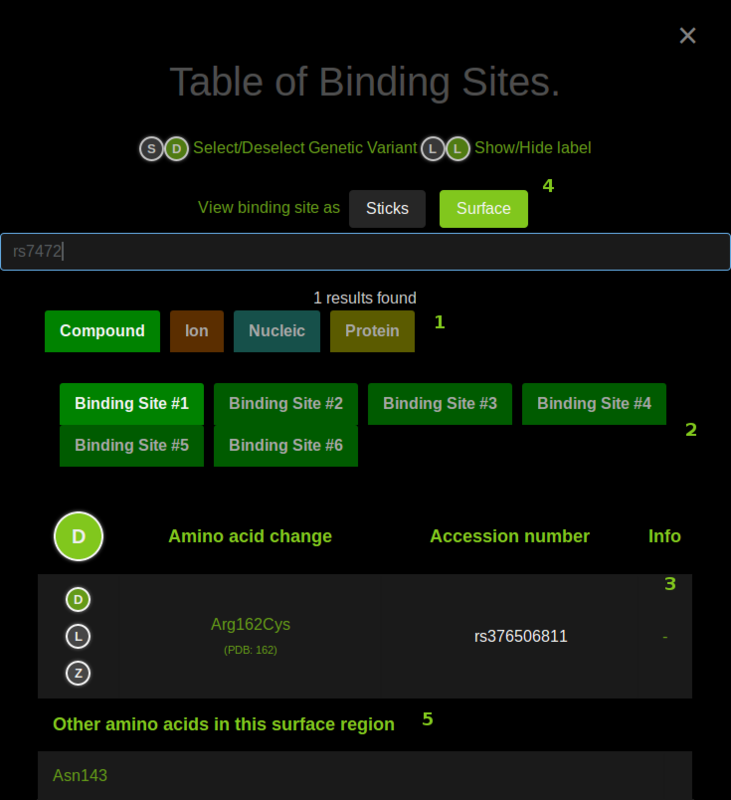 ** Binding site tabs are synchronized with binding site tabs in Table of Ligands. In the Table of Ligands all binding sites are listed as tabs. ** First level of tabs are binding sites separated by type of binding site (1) and second level are bindng site of one type seprated by their binding site number (2). Only one binding site can be viewed at the time. Under each binding site tab there is a table of ligands belogning to that binding site. Ligands are grouped by their three-characters-long name (3). For each group there is information about the structure-image (4), name and the number of the ligands in binding site with the same name (5). 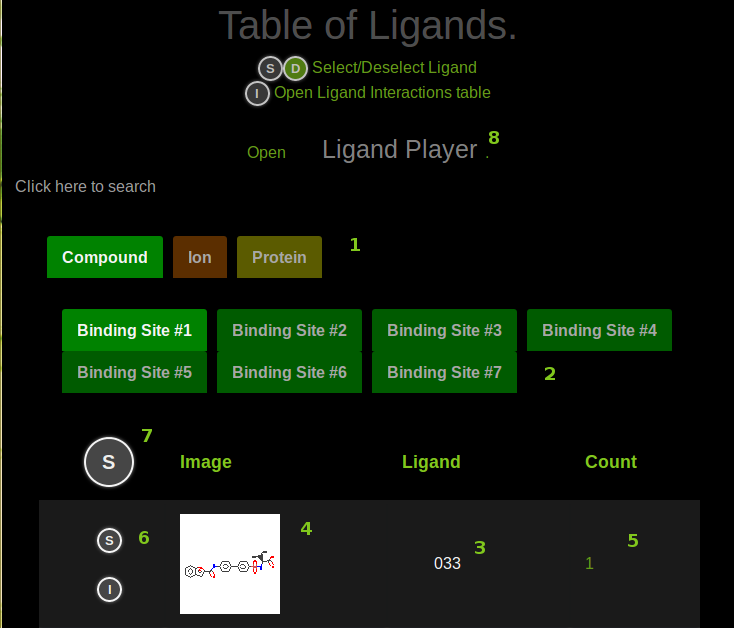 For each group there are also two buttons (6): Select / Deselect button which shows/hides all ligands in the group on the structure and Ligand Interactions Table button which opens a Table of Ligand Interactions. Select / Deselect All button (7) shows/hides all groups on binding site at once. For viewing one ligand per second open Ligand Player (8). ** Binding site tabs are synchronized with binding site tabs in Table of Binding Sites. Table of Ligand Interactions is a classical table in which you can see the detailed information on ligand interactions. A click on the row zooms on the corresponding Sequence Variant in the structure and shows its ligand pair and the bond between them. 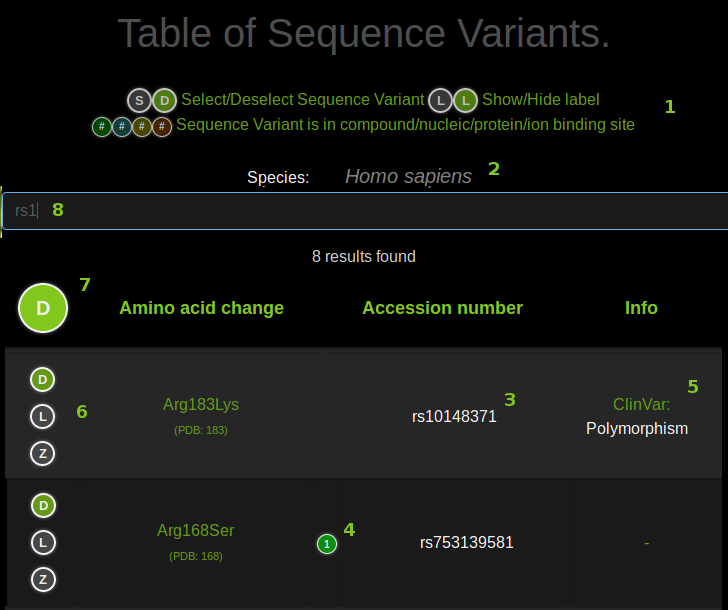 In Sequence Viewer you can view Sequence Variation, Binding Site and Evolutionary conservation information on a sequence. By default only the information of Evolutionary conservation (1) is shown. Then you can select which binding sites you would like to view. (2) Sequence(3) is than rendered and colored according to your choice. You can see the meaning of different colors in the Legend. (4) For every aminoacid in sequence you can view information about PDB, UniProt and possible Accession numbers and secondary structure information by hovering over the aminoacid. (5) A click on Sequence Variation in sequence will zoom on the selected aminoacid in the structure. You can save the Sequence Viewer image by clicking the Save as Image button(6). The Sequence Viewer can also be minimized for easier interaction with structure. Display: toggle display of waters, hydrogens and possible ligands. Sequence Variants: opens a Draggable Table of Sequence Variants selected in the Table of Sequence Variants or Table of Binding Sites. Focus: zooms in on the structure and sets the center of rotation to its center. ** Color and style of selected Sequence Variants do not change. Show / Hide button (1) shows and hides the Sequence Variant from the displayed structure, but it does not deselect it from the Table of Sequence Variants or Table of Binding Sites. Zoom in / Zoom out button (3) focuses display on the selected Sequence Variant and changes center of rotation to that Sequence Variant. ** Second click on the button zooms out and returns center of rotation to center of structure. Only one Sequence Variant can be zoomed at the time. ** Label and zoom buttons are synchronized with the label and zoom buttons in Table of Sequence Variants and in Table of Binding Sites. (exit button) closes the ligand player. The first cell of the ligand player shows the name of the ligand and its serial number in the current binding site. Ligand player can easily be accessed from the main menu with a click on play icon . ** Image can be saved using one of the following up-to-date browsers: Mozilla Firefox, Chromium, Chrome or Opera. GenProBiS is an interactive web platform, of which main aim is to ease exploration of biological interaction data of various levels, up to resolution of a protein structure. insilab.org - our project page. Janez Konc, Blaž Škrlj, Nika Eržen, Tanja Kunej, Dušanka Janežič. GenProBiS: web server for mapping of sequence variants to protein binding sites. Nucleic Acids Res., 2017, 45, W253-W259. 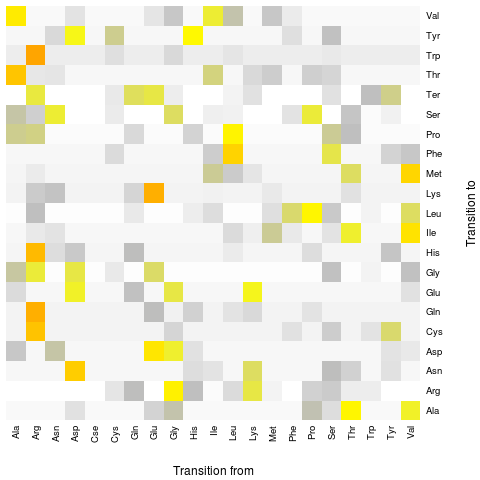 Current amino acid mutation-transition probability matrix, represented as a heatmap. I click on Search button and nothing happens. Why? We recommend using Firefox or Chrome/Chromium. If you are already using one of the above browsers try updating it. If it still doesn't work let us know. * Known problems with downloading sequence image. ** Known problems with downloading both structure and sequence image. My search returns "Oooops. No Sequence Variants were found for this PDB.". But I am certain that Sequence Variants exist for this PDB. In this case please email us which PDB this is and a reference to Sequence Variation information. Upon loading the data from the link, one obtains Sequence Variant/PDB information in comma-delimited file. Data can also be downloaded in JSON format, where the "csv" key in the URL must be replaced with "json". Example table structure is presented in table below. Warning! Some calls might produce large amounts of data and therefore take some time. For specific entries, consider using our API.